Computer Active Quotes me on Lemmings » Oh No! : DMA Design! Computer Active has a very nice blog post about the 20th Anniversary of Lemmings; very nice because they’ve quoted me and asked nicely about using one of my photos! This is probably as good a moment as any to show off my belated joining of Flickr, to which I’ve added a selection of pics from the celebration. Here’s the selection I’ve uploaded. 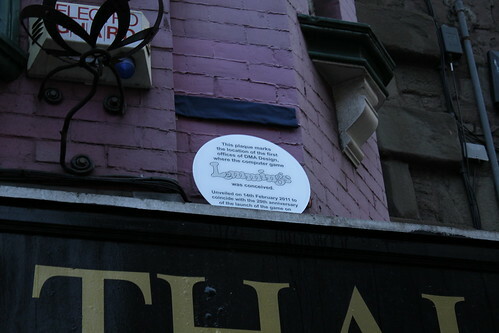 The (temporary) plaque at DMA’s “old old office”. I’m told that there are plans afoot for something a little more permanent. I’ve also taken the opportunity to add this location – and DMA’s other office – to Ben Goldacre’s Nerd Map in case anyone wishes to make a retro computer game pilgrimage.